Cam Newton threw three interceptions against the Giants.Cam Newton did not look like Cam Newton against the New York Giants. Pressure didn’t seem to faze Newton much in his first 18 career starts. But it was a different story against the Giants. Against five or more Giants pass rushers, he was 5-of-10 passing for 83 yards and two interceptions. It’s only the second time in his career he’s thrown multiple interceptions against five or more pass rushers. He threw three in Week 6 last year against the Falcons. Newton’s struggles against five or more pass rushers is rather surprising considering this: He was the second-most accurate QB the first two weeks against five or pass rushers among players with at least 20 dropbacks. 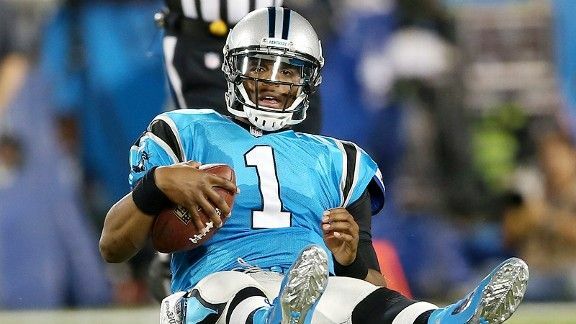 Only Alex Smith (85.0) had a higher completion percentage than Newton (72.7) in those situations. The Panthers’ success relies heavily on Newton’s ability to run the ball to complement his passing ability. The Panthers are now 1-9 when Newton has fewer than 50 rushing yards, including Thursday’s loss in which Newton had just six rushing yards. Last season, Newton never had fewer than 18 rushing yards in a game. But after totaling four yards on the ground in Week 1, his Week 3 total is the second-lowest of his career. Last season, Newton was able to scramble against added pressure. He led the league with 173 rushing yards against five or more pass rushers. But on Thursday, he didn’t have a single scramble against the added pressure. He has zero rushing yards – he hasn’t even scrambled once – this season against five or more pass rushers. It’s Newton’s fourth career game with at least three interceptions and the Panthers have lost all four. The Panthers are now 1-12 when Newton has a turnover and 6-0 when he does not. Andre Brown came to play for the Giants. After being drafted by the Giants in 2009 and bouncing around between five teams over the next two years, he was re-signed by the Giants in August. He replaced Ahmad Bradshaw in the starting lineup and ran for 113 yards and two touchdowns. The Giants have now won 21 straight games when their running back rushes for at least 100 yards and two touchdowns. Their last loss was in 1985, when Joe Morris had 131 and three touchdowns in a 35-33 loss to the Cleveland Browns. Brown had 71 rush yards after contact, the most by a Giants player since Brandon Jacobs in Week 4 of 2010. It’s the second-most rush yards after contact by any player in a game this season. Only C.J. Spiller (116) had more in Week 1 for the Buffalo Bills. Brown wasn’t the only surprise weapon for the Giants. Wide receiver Ramses Barden, another player with limited playing time who was drafted by the Giants in 2009, had nine receptions for 138 yards. Between the numbers, Barden caught all seven targets for 114 yards. Against the Panthers, he caught as many passes as and more receiving yards than his entire 2011 season.